Haridwar literally means the gates to the God. It is the place that is associated with the footprints of the Gods according to the Hindu mythology. The place is one of the sacred places in the country in the Hindu religion. The place is situated on the bank of Ganga in the Uttrakhand state of the country. This is the place where the Ganga leaves the Himalayas mountain route and enters the plains of the north India. Samudra Manthan reveals that this is also the place where the drops of Aamrit fall by Garuda. The place is also host to the Kumbha Mela after every 12 years. The two day tour helps one to rejuvenate and bring inner peace by simply visiting the place. The tour plan takes pilgrims to Mansa Devi temple, Shantikunj ashram, Jain temple, Daksh temple, the Chandi Devi temple, the Maya Devi temple, the Mahadev temple, Sapta Rishi temple, Ramanand ashram. The bath in the holy river at the Har ki Pauri, the footsteps of the lord is the holiest bath in the Hindu religion After the visit one comes to the hotel for tea and rest and later in the evening goes to the Har Ki Pauri for Aarti. The tour can be taken during the weekend for instant rejuvenation and relaxation amid a scenic landscape and soothing ambience. Just being part of the Aaarti at the Har Ki Pauri at the Ganga ghat is enough to enrich one with spiritual bliss and get instant relief from fast paced working life. The peace and serenity will remain with the guest for a long time after the end of the package. 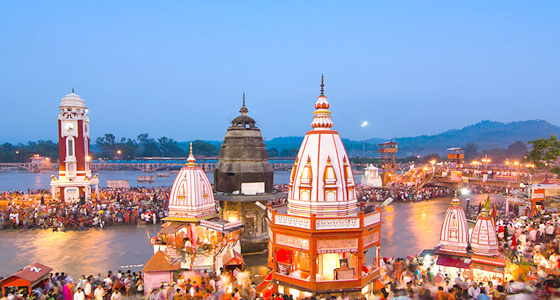 The Hariwar tour packages covers welcome drink refreshment, hotel stay, breakfast, dinner and pick up and drop from airport or railway station. The local transportation in air conditioned vehicle and state taxes, parking, tolls, and toll taxes. Our representative will drop the guest the airport or railway station as per the tour plan.